Now apparently this flavor is from an employee suggestion and it definitely strikes a few notes of fancy schmancy appeal. One, we've got maple ice cream as the base. Two, it's got waffles. Three, we've got a blueberry swirl for a change. 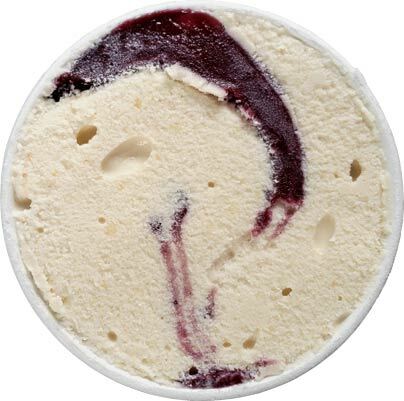 Blueberry ice cream is very old school, but a nice blueberry swirl does have potential in this application. I say that because how many breakfast inspired flavors wind up not wowwing? I'm trying to think of something with pancakes or waffles that I've liked (doh, apparently Yeti Frozen Custard died). Let's jump to the good stuff here because mix-in and swirl wise, this flavor is pretty impressive. 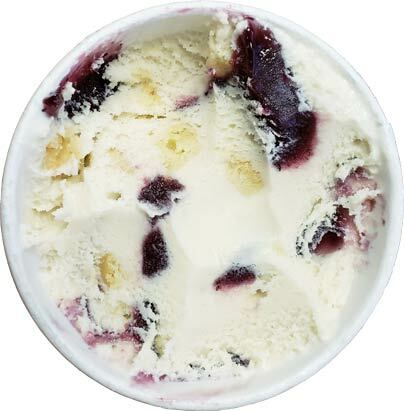 There is a ton of blueberry swirl in the first half of the pint as well as tons of these waffle bits. It seems like every bite has both, plus you still get that maple flavoring in every bite. I won't go so far as to say that it tastes exactly like a blueberry waffle, but it is definitely fun and I could see myself eating this one until I was overly full. Is it perfect? I'm afraid not because this is just Cumberland Farms ice cream and they don't do top notch ice cream. The overall texture is so-so (always is) and there is a bit of soapy pop to the flavoring. I don't know what to call it because my brain registers is as a mild tingly/soap flavoring, but you'll know what I mean if you pick up this pint. I say it like that because I would recommend picking this one up unless you are anti-maple or anti-blueberry. I'm not a huge fan of either and yet the busyness of the pint easily pushed me along to my next bite. So yeah, this was a fun pickup. I think of Museum of Ice Cream trying to be cool and basically failing and then here's Cumby's going with a full title flavor blow out. Good job Cumby's, even if it's not perfect. On Second Scoop: Boy this pint is busy. 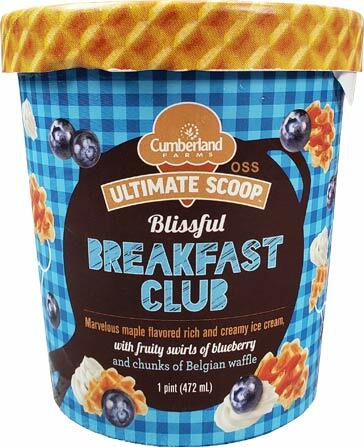 I didn't even need to finish the second half of the pint because it's just that busy and a quarter of a pint was enough to add a big blueberry and waffle bit blast to my mid-morning snack break. I definitely thinks other companies should try this idea though I have a sneaking suspicion that a heavier, super premium texture like Haagen-Dazs might weight this down a bit (ahh, who am I kidding, it would still be great). Oh yeah, I still can't describe that bit of flavor weirdness (yesterday's soap comment), yet here I am, still recommending this one. It's a mad mad mad world out there. Yes a "super premium base" with the same quality and abundance of mix-ins would be way too much. That would push it to 500+ calories per serving which is probably enough to make many people sick. Because let's be real here : who really stops at 4 oz of a flavor they especially love? With that said, I would be willing to try this if it were available to me. I love waffles and fruit purees. 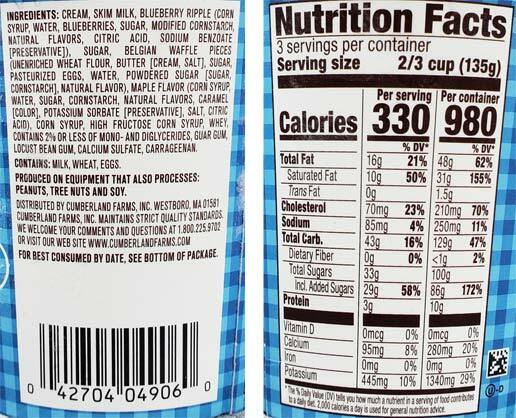 This nutrition label is based on the newer, "more realistic" serving, aka 1/3 of a pint instead of a 1/4. 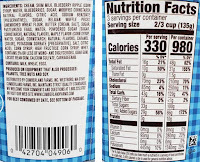 Ol' skool math puts it as 247.5 calories per 1/2 cup (1/4 pint) which still leaves room for improvement to a better base. Ah okay. I see that now. But 247 is still pretty high. My favorite Turkey Hill flavors are very mix-in heavy and sweet but they still don't exceed 200 calories. Is the texture of this ice cream akin to Turkey Hill or something? The texture isn't that good unfortunately, but to place it, it's less than a super premium but probably a bit denser than say turkey hill.